or House of Vedius Siricus and Vedius Nummianus. VII.1.25 Pompeii. Casa dei Principi di Russia, second entrance to VII.1.47. VII.1.46 Third entrance linked to VII.1.25 and VII.1.47. 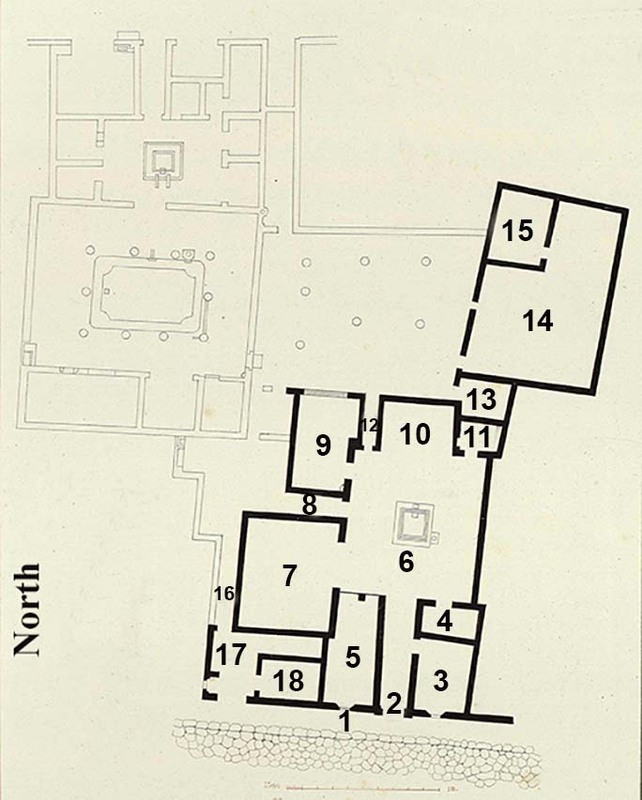 Please note that the numbers used for the rooms on pompeiiinpictures are based on the combined plan for VII.1.25 and VII.1.47 in PPM. See Carratelli, G. P., 1990-2003. Pompei: Pitture e Mosaici: Vol. VI. Roma: Istituto della enciclopedia italiana, p. 228. 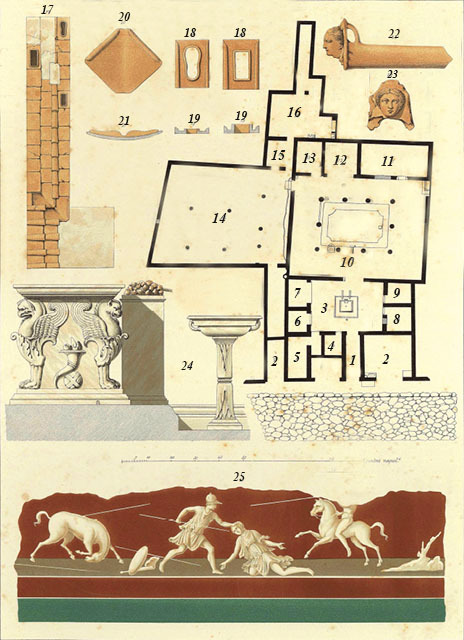 Please note however that the numbers used for the rooms on pompeiiinpictures are based on the combined plan for VII.1.25 and VII.1.47 shown above. VII.1.47 Pompeii. 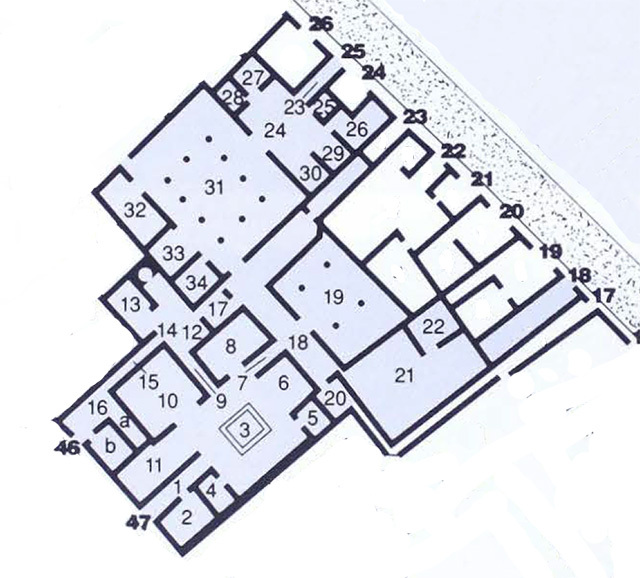 1854 plan of the house, based on Niccolini. 2: VII.1.47 entrance fauces closed by two wooden doors with many ornate bronze studs and an iron lock. See Niccolini F, 1854. Le case ed i monumenti di Pompei: Volume Primo. Napoli. Casa di Sirico, pp. 1-5, Tav I.
VII.1.25 Pompeii. 1854 drawing by Giuseppe Abbate of plan and ornamental details from Strada Stabiana Casa No. 57. See Niccolini F, 1854. Le case ed i monumenti di Pompei: Volume Primo. Napoli. Strada Stabiana Casa No. 57, Tav. I. 25: Painting from the side of the door of the exedra possibly Alcmaeon killing his mother Eriphyle.